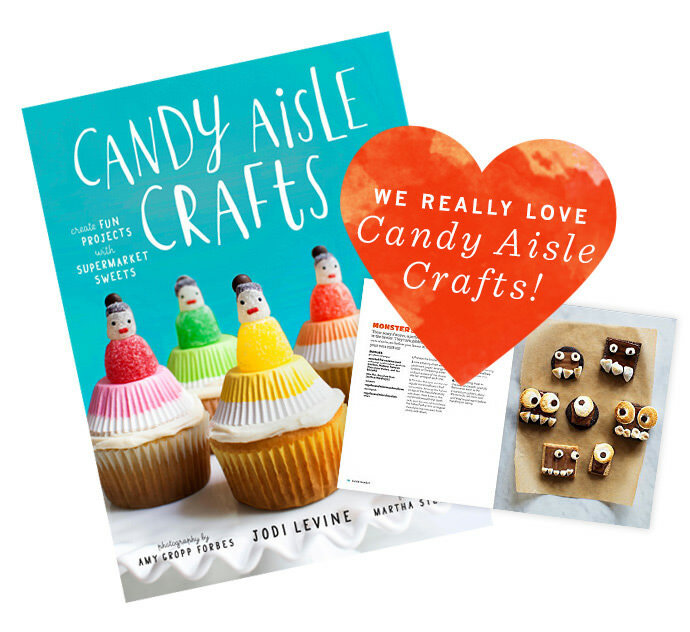 Here’s another super sweet project from Candy Aisle Crafts, the latest book from crafting superstar Jodi Levine. 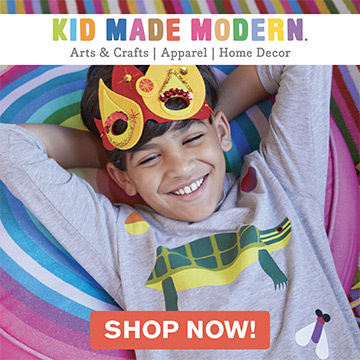 The supermarket candy that she melts, twists, and fashions into tiny works of art are simply incredible (and truly designed for children to make). We give this book a box of gold stars because 5 stars simply aren’t enough. We know we’re going overboard here, but we are seriously in love with every page! 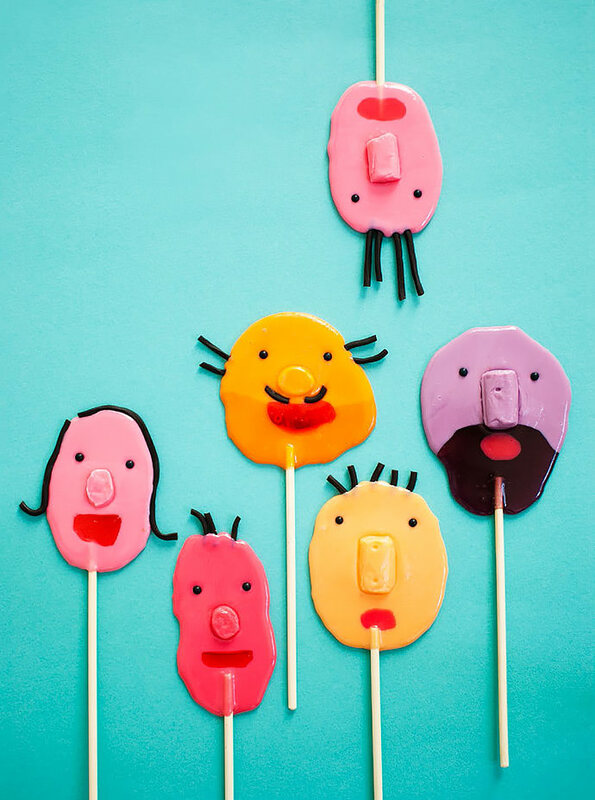 Amy and I talked about including a page of people portrait lollipops. When she suggested that I try making Bert and Ernie–like faces, I was inspired! The “five o’clock shadow” design was a happy accident caused by using two slightly different colors of candy. For the large dimensional noses, I dropped an unmelted candy onto the hot lollipop. Preheat the oven to 275°F. Line a baking sheet with parchment paper. 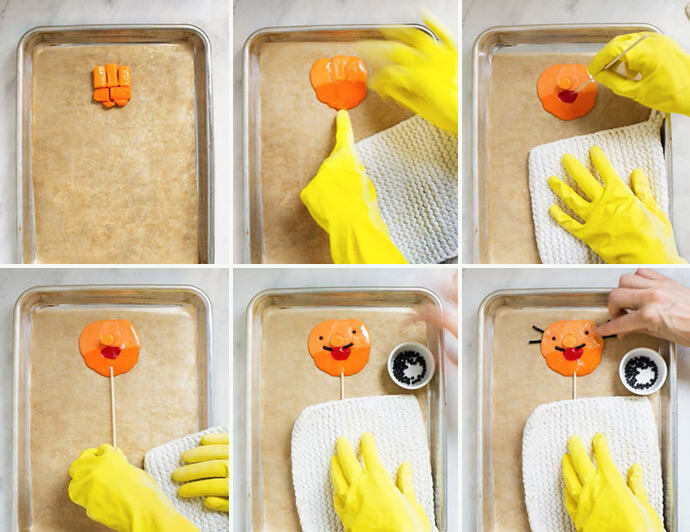 Cut the beard-colored candies with the scissors to taper the face at the bottom. Arrange the candies on the baking sheet (A). (Reserve the half piece for the nose.) Place in the oven for 5 to 6 minutes. Remove and let cool for 45 seconds to 1 minute. Reshape (B) and press on the red candy for the mouth. Return to the oven for 2 minutes to melt the mouth. Remove and let cool for 1 minute. Use a skewer to tug at the mouth to shape it into a smile and drop on the reserved nose piece (C). Add the stick and twist to cover with candy (D). Be sure to check out the DIY Clown Cake Topper project we posted last week, where you can enter to win a free copy of this amazing new book! Oh, this looks like so much fun! I’ll have to try it with my nieces an nephew! Thanks so much for the tutorial! These are hilarious! I need a shipment of Jolly Ranchers to Sweden! Cuteness on a stick! And a great way to put your best face(s) forward at family get togethers – one for each person.